If you've been following this blog, then you know I'm unlikely to be terribly objective in regards to the new Drew Barrymore directed movie, Whip It. League-Pal Shauna C. wrote the thing, and we're just terrifically happy for Shauna this evening. I also have some unusual insight into the thing as I read the script a long time ago, and thought it pretty darn good. On the screen and having been developed with a particular vision, I'm happy to say, I enjoyed the final product even more than I'd expected, based on what I'd read. 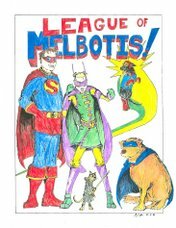 I won't dwell on the changes, largely because its irrelevant, but The League gives the movie, like, 7 thumbs up. 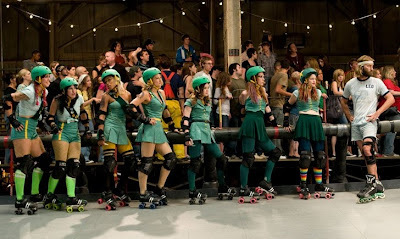 Roller derby as a sport is a bit confusing at first, but the movie's exposition seems to cover the necessary bases so the play of the sport isn't baffling. And that's a good thing, as I know the first time Jamie and I attended a bout, there was a lot of confusion. But the storytelling of the film more or less makes it easy to follow, at any rate. 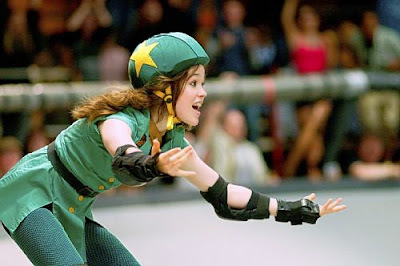 Roller Derby players will probably be able to spot irregularities and "whatever" moments, but by and large, the movie seems to capture the toughness, athleticism and fun inherent in what I've seen when I've gone. But the movie, like all good sports movies, uses the sport as a framework for the characters and their arcs. And in this case, its a story about a girl coming into adulthood and coming into her own in a way that her parents hadn't planned on, and really aren't going to understand. The cast is very good. I'm going to admit something here: I didn't like "Juno", so I had no opinion in regards to whether Ellen Page would be good in the role of Bliss, the high school aged protagonist. But, indeed, Page is quite good, and has the rare quality of appearing to actually be the age of the high school character she's portraying. Juliet Lewis and the rest of the cast are excellent, but the real stand outs are going to be Daniel Stern and especially Marcia Gay Harden as Bliss's parents, who the movie does an excellent job of making nuanced, believable characters with believable motivations when they could have been far, far less. That said, I'll also be surprised if Kristin Wiig doesn't find herself landing a new range of roles thanks to her role in this movie as well. Anyhow, Austin audiences will get a kick out of the odd intermingling of scenes shot in what is clearly NOT Texas (the film was shot 97% in Michigan), but seeing a few bits in Austin, including the very theater I was sitting in during the screening (which was met with great applause) was a lot of fun. It was interesting to see Austin portrayed as the destination point for getting out of the lives parents would have preferred for their kids, which is a bit glossy in this movie, but there's also a certain truth to it, even as the town expands and becomes ever more homogenized. * So while I sort of cringed after a while that they made damned sure we knew the characters were in hip, hip Austin, it is useful to tell the story of one of those kids in high school who was pretty sure they were dissatisfied with the way things were going and was looking for their outlet. And I'm glad Shauna was the person to tell that story. Angry mother of a high schooler asking for an explanation when you walk in the door? Hoo boy. Does that bring back some memories. I'm not going to suggest that "Whip It" is experimental art-house cinema that's going to change the world of movie-making, but I do think if the audience is coming, expecting a movie aimed at tween-agers, they're going to be pleasantly surprised. As the vast majority of the characters are actually adults, the gap between adulthood and the expectations of the high schooler as they reach for adulthood, is part of the point. Unlike most media these days, the movie does not pretend the characters are already adults, as we've come to expect in the era of the ridiculous teens of "Gossip Girl", the all-new 90210, The Hills, 16 and Pregnant, and even the shiny kids of Glee (whom I love and will beat you up of you say anything bad about them, but high school is mostly just a backdrop to get these characters together). It should be mentioned: not just for a first effort, but in general, Drew Barrymore's direction was impressive. There were a lot of ways this movie could have gone wrong, but rather than take a script which could have easily become a dull family comedy, she managed to respect and care for all of the characters. And, some of the camera decisions were downright inspired. Anyhoo, we recommend. Go check it out. This has been a particularly exceptional year for well written films. "Whip It" fits in nicely.